MOE (later dubbed "Big MOE") was designed to play Co-opertition first. The field was split in half by 2 raised troughs and a ramp under a 5-foot-high bar. 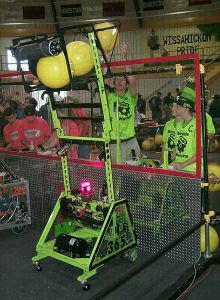 Robots scored points by placing rubber balls in their alliance's trough. Extra points were scored by robots hanging off the center bar. MOE had a large arm and basket which help up to 8 balls. The arm also allowed MOE to hang from the center bar and, to our surprise, could right our robot if we tipped over. This was the first year first had alliances. There were 2 robots per alliance.